Stress response: water stress increases ABA production that initially induce stomatal closure and later increases water holding capacity of root tissues and promotes root growth and inhibits shoot growth. Incorrectly named, not related to abscission, ethylene is the hormone that is directly involved in abscission. 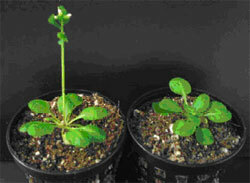 ABA promotes abscission.